How long do you want these messages to remain secret? I want them to remain secret for as long as men are capable of evil. Computers had their origin in military cryptography. In God we trust. Everybody else we verify using PGP! Fully secure systems don't exist today and they won't exist in the future. Beware of Snake Oil Cryptography. Don't roll your own Crypto! Anyone, from the most clueless amateur to the best cryptographer, can create an algorithm that he(she) himself(herself) can't break. The problem of randomness (or people are a poor source of entropy). Security wins many battles but loses the security war. We are definitely going backwards in computer security. 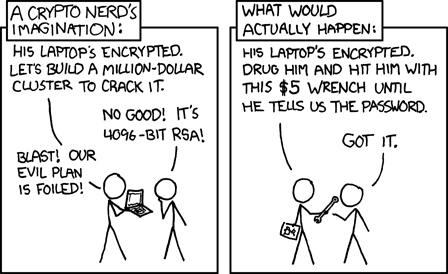 "Why Johnny Can't Encrypt" or "On unusability of PGP and other crypto softwares". The danger of rubber-hose cryptanalysis! All models are wrong, but some (like Random Oracle Models) are useful. Information security is only as strong as the weakest link. The strongest link is cryptography and the weakest link is human factor. Crypto means Cryptography, not Cryptocurrency.